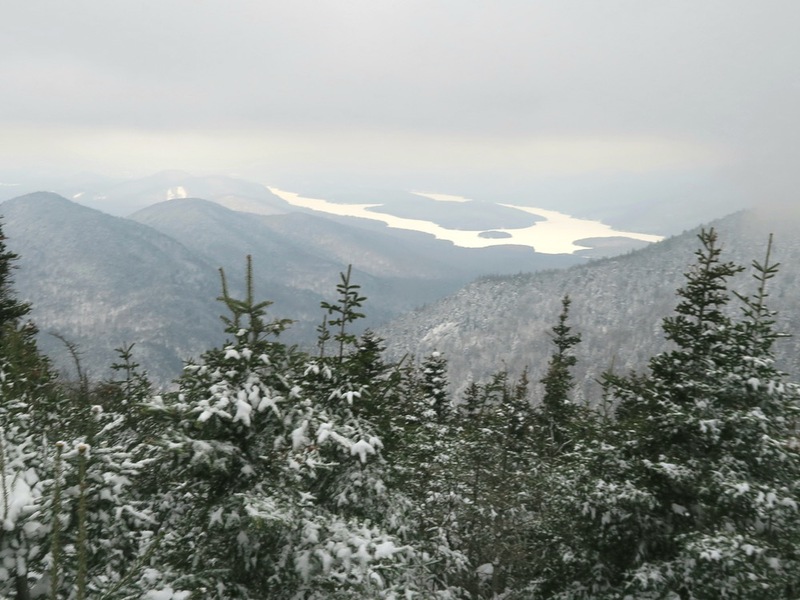 Since my fateful and educational collision with a tree at Stratton in early December, I watched my social media feeds with a mixture of jealousy and anticipation as the east got some good early season snow. Surely, I thought, Ullr’s bloodthirst was slaked due to my offering, and he was preparing the mountains for my return. 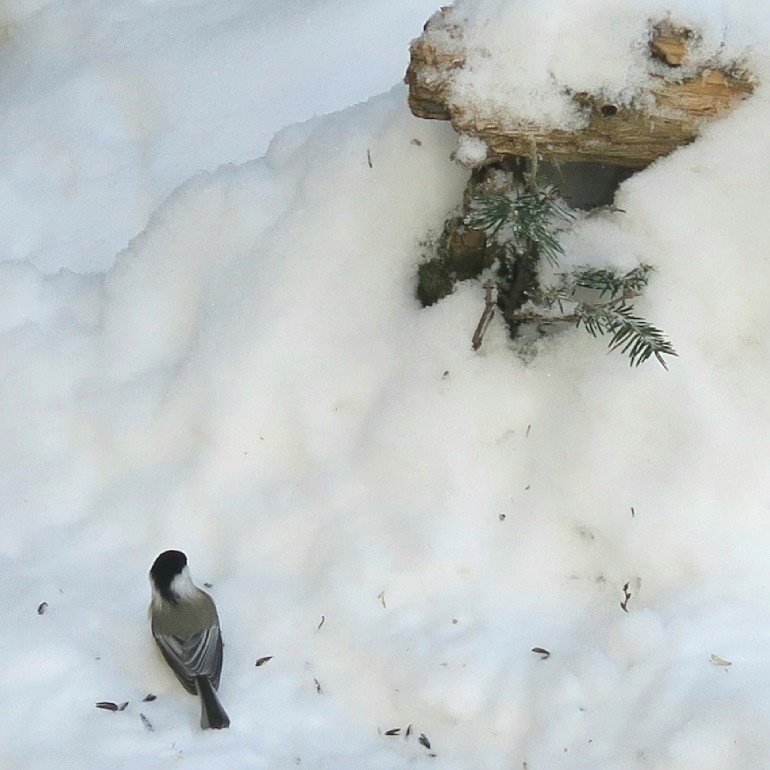 Then, right on schedule, came the January thaw. All of that glorious fluff gone thanks to two days of rain and near-60-degree weather. I began to dread the ice that would follow as I now fear ice in a way I hadn’t before. But as I kept an eye on the forecast and saw that some areas were due to get up to eight inches of fresh snow, I grew excited and decided to head up north for the first time in six weeks. My stoke level was high as I packed my gear and tuned my skis for the long Wednesday morning drive to Killington. When I arrived at my favorite Northeast resort, I couldn’t have been happier to see that five inches of fresh had fallen overnight, with three more in the forecast. Sure, the glades and the trails that relied on natural snow had wiped out, and there were sections that became increasingly scratchy as the day wore on, but the entirety of Killington was covered with a deep-enough layer of confidence-building light snow, and I quickly found my ski legs again. The conditions were so good that I had to repeatedly tell myself to dial it back, that my leg muscles had atrophied during my absence from the mountains, and that one small mistake can lead to huge consequences. I wanted to rip, and rip I did, but I ripped responsibly. I started the day with a mellow, long peak-to-base cruise from the top of the K-1 Gondola, weaving my way onto and off of Great Eastern, all the way down to the Skyeship base – a thigh-burning run of more than 3,000 vertical feet. I grew more confident and ventured over toward Bear Mountain and down the steep and grippy Wildfire. 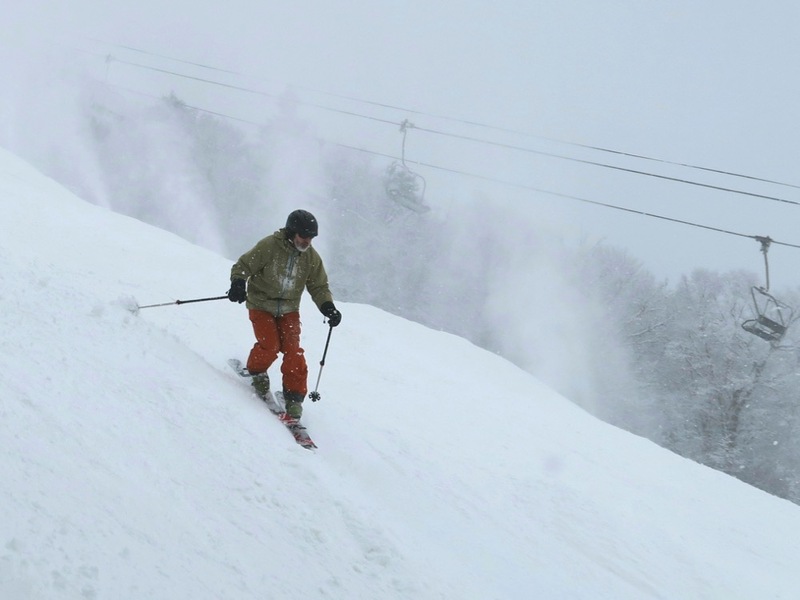 I talked with one of Killington’s green-jacketed mountain ambassadors and asked him what was skiing good that day, and he told me he’d just had a blast skiing down Lower Ovation. Did I really have the guts to brave one of the mountain’s steepest and most notoriously finicky trails? But he assured me that even though the guns had been running to fill it in the day before, the un-groomed whales that remained were edgeable enough to make a slow, considered descent a fun and challenging time. I’ve understood from my early days as a skier just over three years ago that overcoming fear is a big part of progressing in this sport, and so I took his advice and dropped into the giant whales of Lower Ovation from the well-named elbow of Launchpad. The top half was sheer terror, but by the time I reached the bottom I was laughing and whooping. I had taken my fear out behind the confidence shed and put it out of its misery. I now had the courage to face Superstar, despite the guns blasting along the side of Killington’s signature trail. I lapped Superstar for the rest of the day before my sore legs prompted me to call it quits. I’m not the superstitious type, but at the same time I never call “last run,” though I do think it from time to time. Tired and hungry, I grabbed an early dinner of twofer-tapas at The Garlic, my favorite Killington eatery, and set my alarm for 5:30 the next morning. I had plotted out a two-and-a-half-hour drive eastward to Loon, in central New Hampshire, and I aimed to get there in time to boot up for tenth chair (I’m rarely a first-chair type of guy because I hate lines, but I’m a huge fan of tenth chair, when the rest of the junkies have all jostled their way to the top of the mountain). If Killington was my re-introduction to ideal east coast conditions, Loon forced me to confront the more frequent experience of dropping down icy groomers that become increasingly deadly as the day wears on. Not for nothing is the Northeast known for its white ribbons of death, and as any of us hardened right coasters will tell you, if you’re going to ski the steep stuff on a crisp day, better get to it early. I made my way to North Peak to hit some of Loon’s steeper trails, lapping Walking Boss and Flume, and carving deep trenches into long stretches of untouched cord before making my way back toward Loon Peak. 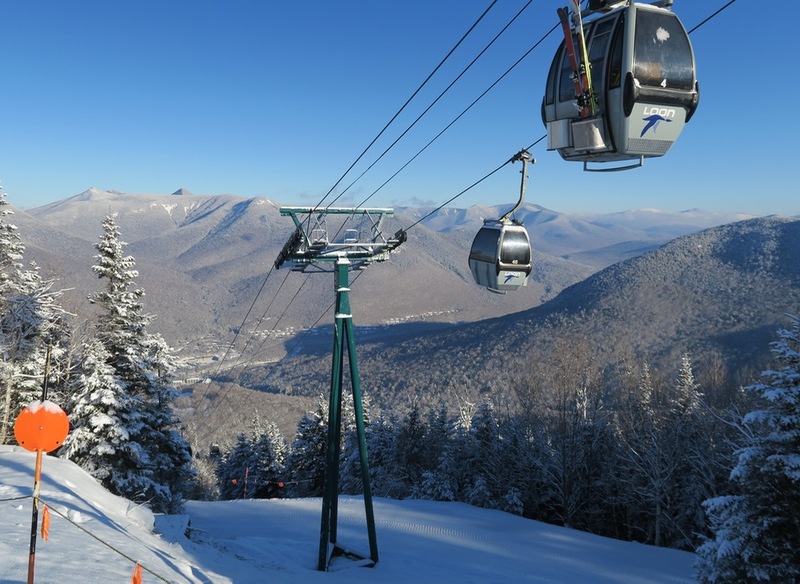 I asked a few regulars on Loon’s cozy four-person gondola what their preferred method of attack was and they recommended that I make my way toward South Peak via the down-and-up fixed-grip Tote Road Quad, and ski the south side of the resort before the crowds make their way over. I took their advice, hitting the firm lines of Cruiser and Twitcher, then made my way back toward front face. I aimed to take a few more runs before breaking for an early lunch (I’m Johnny 11:15 when it comes to lunchtime) but found myself diverted to the tiny, easy-to-miss trailside bird sanctuary on the left of one of the more popular frontside trails. Most people zip right by it, but it’s a uniquely appealing pit stop worth an early visit before the mountain gets skied off and a bird sanctuary visit makes more sense. Then it was back down to the Octagon Lodge at the left side of the awesome little steam train that ferries visitors back and forth between the main base lodges. I grabbed a soup and salad and brought them upstairs to the Paul Bunyan room, where my buddy KC holds court a couple of times a week. It was great to catch up, and to be there on a Full Album Thursday, when the staff gets to choose entire albums to play, front-to-back. It’s a welcome changeup from the standard lodge soundtrack fare, and last week was no different, with everyone from Nathaniel Rateliff to Les Claypool to Afrika Bambaataa providing the tunes that day. They’ve been doing it every Thursday for five years, they’re up to album 688, and they’ve never played the same album twice. Everyone in the whole bustling bar seemed to know each other on a first-name basis, and it’s one of the most welcoming slopeside saloons in the Northeast. Then it was back to the hill for a series of frontside runs until the trails got a little too scratched off, and, still ice-shy, I called it early in order to rest up for day three, and for the ride back to Vermont and to Okemo. By Friday I was deep into my winter road trip rhythm. Wake before sunrise, grab a quick bite, then head out onto road while playing my favorite New England road game “find the local NPR station.” Okemo was fantastic that day, with chalky snow, almost no ice, and 91 trails to choose from. I started the day the same way almost everyone does, with a ride up the Sunburst Six, the resort’s signature orange-hooded heated bubble chair. Of course, Okemo’s varied collection of glades were still closed due to the rain the previous week, but I had a blast skiing all over the mountain, heading over to the Jackson Gore side to get in some rips down the black diamonds of Quantum Leap and White Lighting, then back over to the frontside and toward the South Face, where the wide-open trees of Double Diamond and Outrage looked almost tasty enough to poach, but I didn’t dare duck a rope on such thin cover and risking both re-injury and a possible pulled pass. So I colored inside the lines and spent the better part of the day just racking up vert in the way that Okemo’s fast lifts are great for. 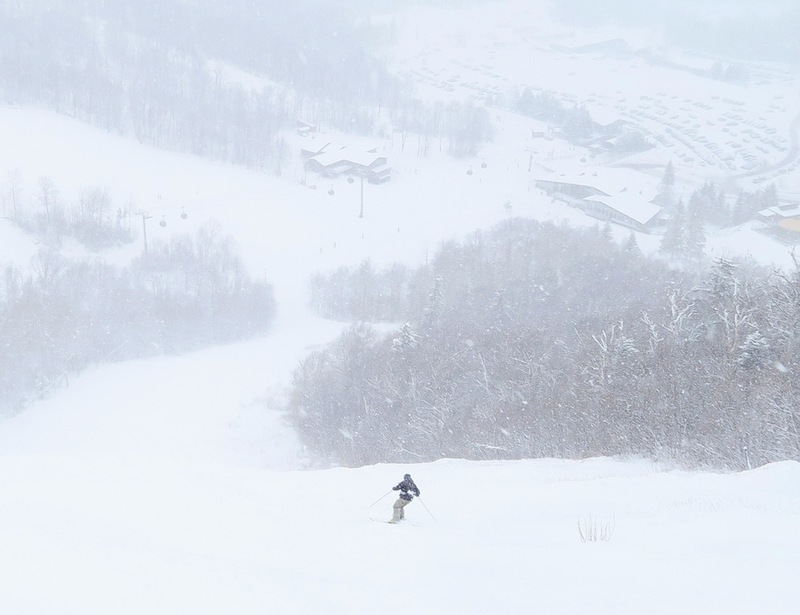 Now, your typical east coast skier would consider three straight days of skiing enough for one week. I had plans to meet a group of six friends, including Icecoastchef, in Lake Placid that night, to ski Whiteface and Gore over the weekend, and I hustled back to the Jeep to make my way across the farm plains of western Vermont, the Lake Champlain bridge back into New York and the foothills of the Adirondacks. I was excited to ski Whiteface and Gore – two mountains which I’d visited a couple of times before but which I was happy to discover had been added to the MAX Pass this season. I wanted to get more familiar with these two Adirondack beasts. Of course, Iceface gonna Iceface. 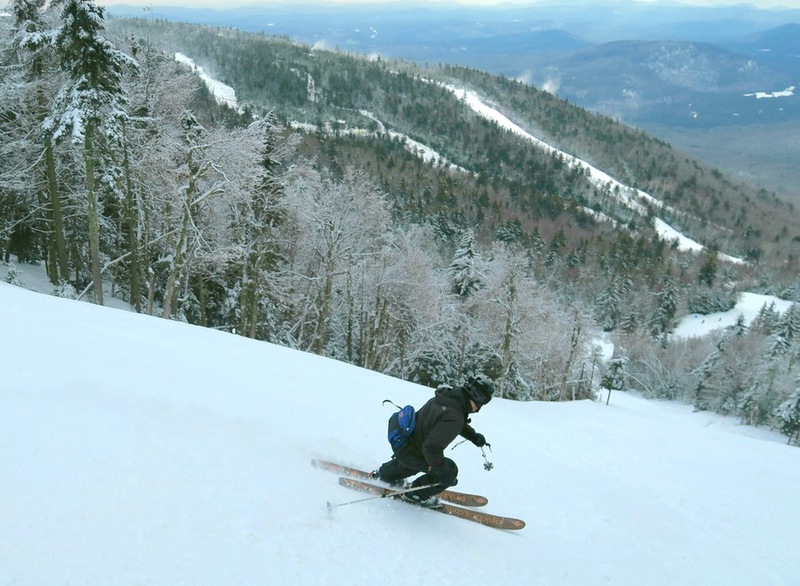 With some of the steepest terrain in the east, Whiteface is a paradise for rippers who aren’t afraid to tune their skis every night, and we made a point to hit up some of the black diamonds early, taking rides down trails such as Essex and Mountain Run. We took a couple of runs down from the peak to the base, a vertical drop of almost 2,500 feet. Then it was up the fast Face Lift Quad and over to the Summit Quad, at the top of which we’d hoped to drop down the recently-reopened Upper Skyward. Alas, it was not to be as we noticed on the way up that the trail had been closed off by patrol – and I’m glad it was. As one of Whiteface’s most exposed experts-only trails, all the fresh snow from the previous couple of days had been blown off by the 30+ mile per hour winds that were whipping across the upper sections. Compounding the weather situation was the seemingly omnipresent cloud covering the top of the fifth-largest mountain in New York State. Visibility was about 15 feet, inspiring no small amount of vertigo and causing skiers and riders at the top to navigate the small upper cat track carefully lest they get blown off the summit by the brutal winds. And even though the entirety of the steep terrain of Lookout Mountain, on the right side of the trail map, was closed due to lack of snow cover, there was plenty to keep our group busy by lapping runs such as Niagara and Victoria (which, because of the wind patterns and the snow gathered toward the left side of the trail we all agreed was the run of the day). The rest of the day was spent ripping down lower mountain trails such as Brookside and River Run, and we finished out the day on a fun little race down the rollers and banked turns on Wolf. We skipped the show at the World Cup Freestyle Aerials competition and instead opted for dinner and beers at the outstanding Lake Placid Brewery, Big Slide. As everyone will tell you – order the fried chicken. By this point I was feeling the effects of four days of skiing and driving, but I sucked it up and turned in early for the hour-and-a-half drive from Lake Placid to Gore Mountain, where we met up with our esteemed publisher, Harvey, who we were excited to finally meet in person after working together these past couple of months. I’d been to Gore once before, about two months into my skiing obsession, but I had no idea how fun this Adirondack gem could be because I simply didn’t have the skills to ski it before. Putting aside the fact that all of the mountain’s glades were closed thanks to the rainpocalypse of the previous week (and Gore’s glades are one of its big selling points), we had more than enough to keep us busy on the multiple faces of the sprawling ski area. The steep black terrain off the top of the Straightbrook Quad was fast and fun, with the even-steeper double black terrain of Lies providing some of the morning’s best thrills. Icy and stomach-churning in parts, this is definitely one of those trails that are best visited in the morning before all evidence of groomers has disappeared. Since both Harvey and Icecoastchef are experienced Gore skiers, I followed them around for the rest of the day, trusting their judgement and going for the ride as I got a personalized tour of one of the Northeast’s most underrated and diverse ski areas. Standout trails included Sagamore, down below the super-fast Burnt Ridge Quad, one of Gore’s newer detachable lifts, as well as the race-prepped Echo, which opened up once the ski racers were done with their events. But the run of the day was the small steep expert terrain of Fairview, right below the Northwoods Gondola, which had been built up beneath the snow guns and hadn’t yet been groomed down. Those giant snow whales were grippy and fun, and provided some of the most enjoyable turns of the day. Sure, I was frustrated by the lack of gladed terrain, and everywhere I looked I saw tree run drop-ins that beckoned, but I resolved to revisit as soon as winter returned in full form and to spend a few days exploring Gore’s wooded trails. After all, I had just skied five days in a row after an serious accident which could have just as easily left me in a wheelchair or worse. I’d found my legs again, found my courage, and even found a mountain that I’d been criminally ignoring these past three years. And I had absolutely nothing to complain about as I set out on the long drive back home to the city. Five days, three states, and almost a thousand miles, but I felt like a new man. Glad to hear you’re recovering. Looks like you’re making up for lost time for sure. most of us mortals are very inspired by your five days in a row with a different area everyday! very cool. how were you able to do such hard and enduring skiing after an injury? even your good, non-injured muscles could have been a major problem with the endurance you obviously gave them. congratulations and thank you for a great article. it was a pleasure to read! Thanks, everyone! The feeling I had clicking back into my bindings was almost beyond words, and I was surprised at how easy it was to get back into the groove once I had taken a few confidence-building laps. I knew I was returning after six weeks on somewhat-atrophied leg muscles – not that the six early season days had done much to build up my quads – and I had to keep reminding myself to not rip as much and to use the slower pace as an opportunity to focus on my carved turns. Slow and steady wins the race – and a little Advil helps. I’ve learned on past multi-day trips that there’s something that happens around day three or four where I’m able to settle in and focus on the small incremental things that lead to improvement, and I’m just lucky to be able to string together some midweek and weekend days to keep myself on skis and work on improving. I’m convinced that short of getting a job on the mountain, the only proven way to get better is to keep at it over the course of multiple days. I know enough to quit when I feel like I’m out of my safety zone, but it has to hurt a little bit if I hope to build up my stamina for that glorious month and a half of spring corn bumps that is getting frustratingly close. Let’s hope we get some serious dumps before then – I haven’t skied real powder or a proper glade this season, and I’m getting itchy for those trees. The forecast for the rest of the week is looking better, though, so I’m confident Ullr will make up for lost time. After all, the dude owes me. If you don’t do it this year you will be one year older when you do.. Words I don’t live by yet. 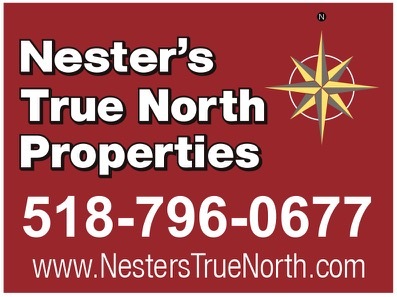 Great write up. I know the feeling about being terrified to get injured again. Interesting to see how people use the MAX Pass — too bad that it’ll probably be discontinued after this season? 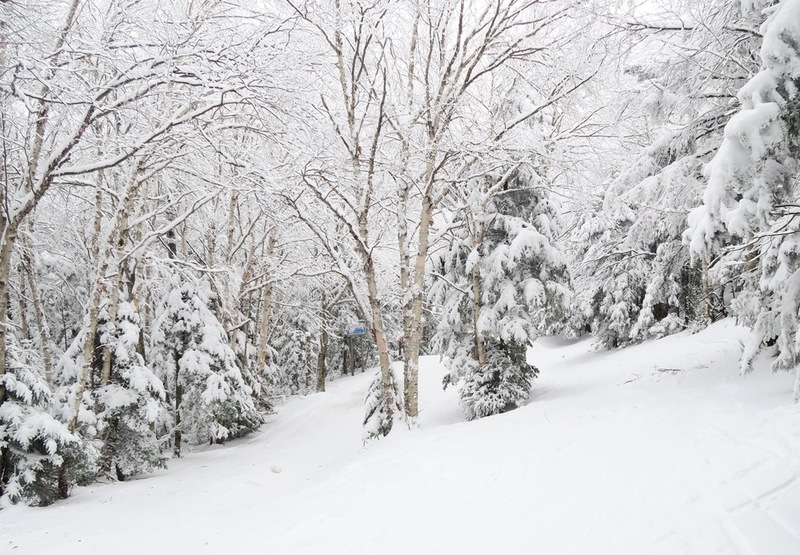 By the way – Ovation our favorite run at Killington… Looking forward to more of your stories.